That is how you say Kia ora or Hello in Oldenburg, which is where my family and I have been living since August 2012. As I near the half-way point in my 18-month fellowship, I thought I would show you where I am living, update you on what I have been up to in the lab, and introduce you to my lovely colleagues here. 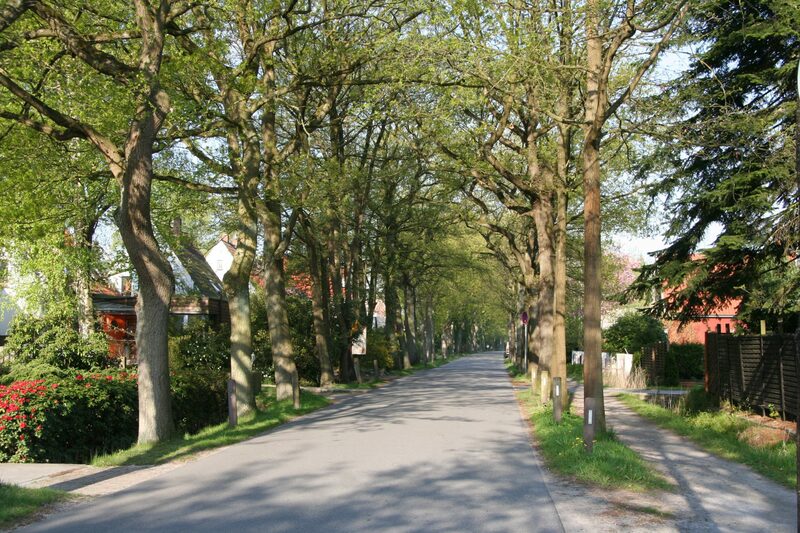 Oldenburg is located in the state of Lower Saxony in northern Germany and has about 160,000 inhabitants, most of whom get around by bicycle, ourselves included. 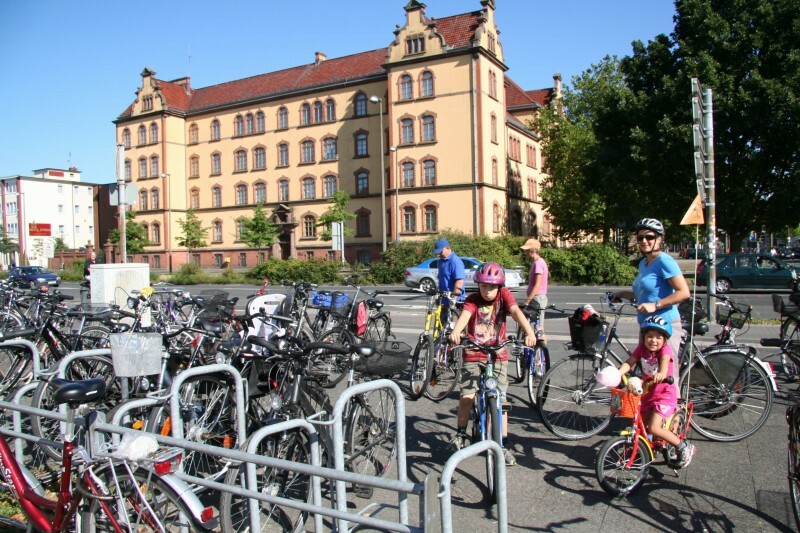 Getting on our bicycles at Pferdemarkt, Oldenburg, Germany, Sept 2012. Photo by Mauricio López. 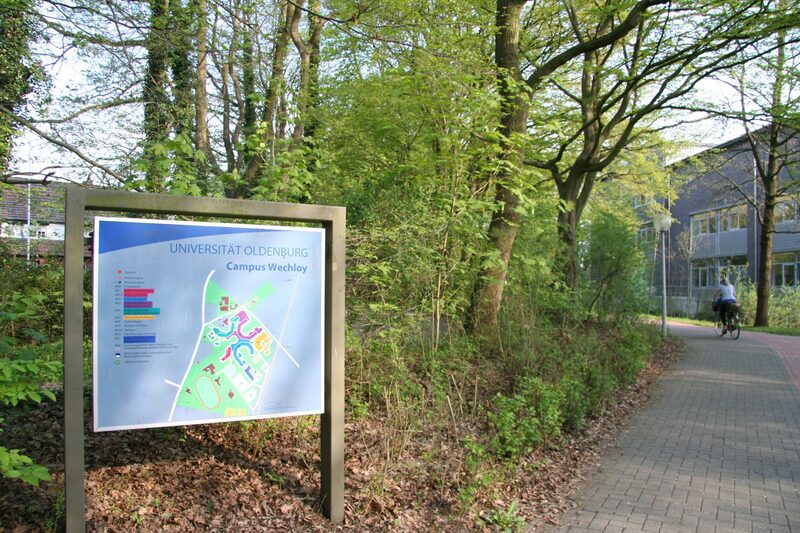 Each day I cycle to the University of Oldenburg, where I am curently based. The best part of my 15-minute daily commute is cycling down the last kilometre along Drögen-Hasen-Weg. My trusty bicycle at the start of Drögen-Hasen-Weg, about 1 km from the University of Oldenburg, May 2013. Note also the beautiful spring flowers! Photo by Heidi Meudt. 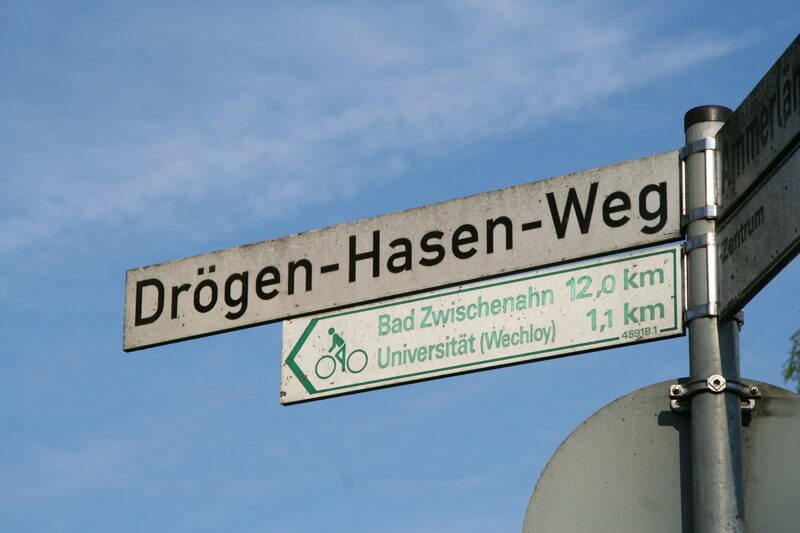 My colleagues tell me that “Drögen-Hasen-Weg” means “Dry Feet Way” in Plattdüütsch, the local dialect of German still spoken in this area. In earlier times, this road was a way for the locals to get around without having to cross any waterways. Photo by Heidi Meudt. The beautiful native trees (“Traubeneiche”, or sessile oak, Quercus petrea) that line this “Eichenallee” (literally, “oak avenue”) are now a protected natural monument. Sessile oak trees (Quercus petraea) along the Drögen-Hasen-Weg Eichenallee, Oldenburg, Germany. Here they are just beginning to show their new green spring leaves, May 2013. Photo by Heidi Meudt. 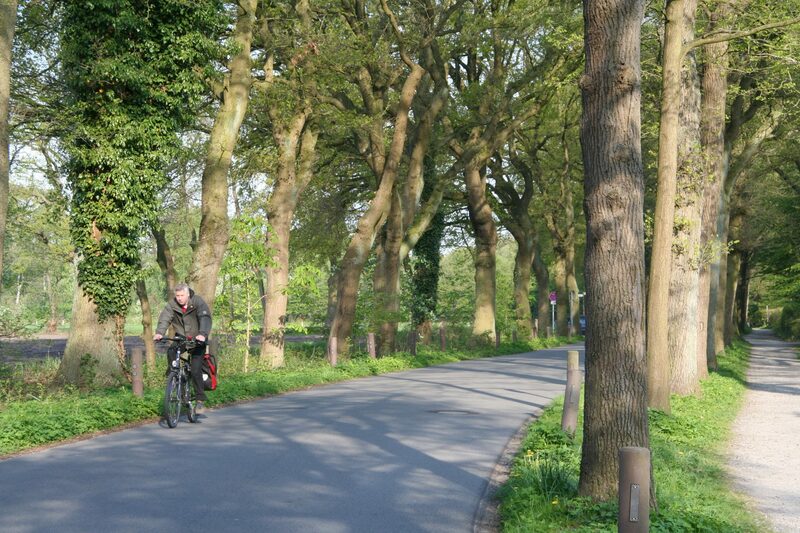 A fellow commuter along the Drögen-Hasen-Weg Eichenallee, Oldenburg, Germany, May 2013. Photo by Heidi Meudt. After cycling through the beautiful tunnel of oak trees (did I mention I get to do this every day? 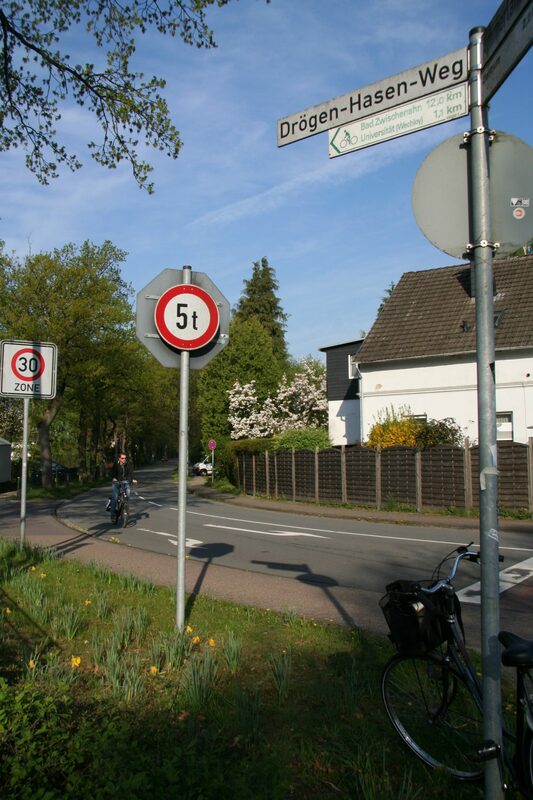 ), I arrive at the science campus of the University of Oldenburg, and turn right at this sign to get to my office. Photo by Heidi Meudt. I have come to Oldenburg to work on a research project regarding polyploidy in New Zealand and European Veronica with Dirk Albach, and in the process learn some new techniques. Polyploidy means whole genome doubling, and it occurs in Veronica species from both areas. We will compare the genes that are expressed in European and New Zealand polyploid species with their closest diploid relatives to determine when these genome doubling events occurred, confirm that the polyploid species likely evolved following hybridisation of diploid ancestors, and compare patterns of evolution of duplicated genes. One of the first things I learned was how to extract RNA, or ribonucleic acid, from leaf tissue. 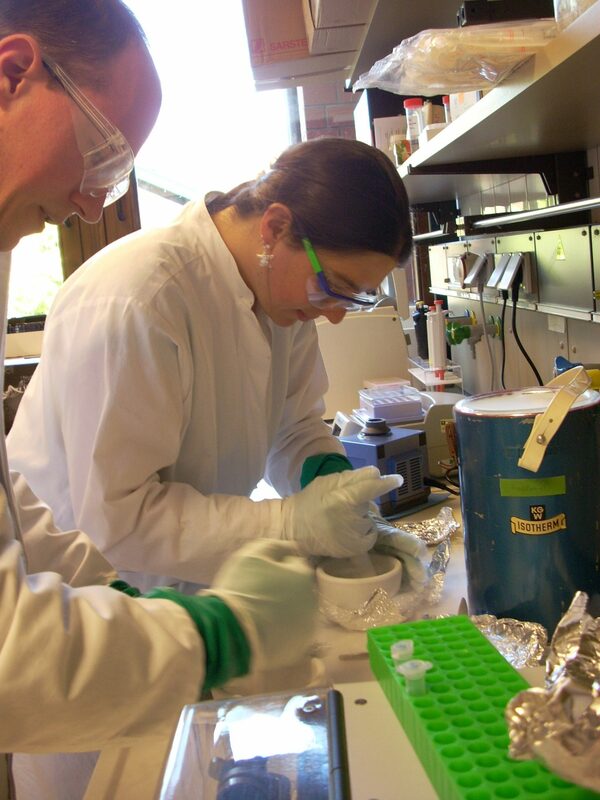 Here I am with Eike Mayland-Quellhorst, grinding up some Veronica leaf tissue in liquid nitrogen for RNA extractions in the lab, May 2013. Photo by Silvia Kempen. Once the tissue has been ground to a fine powder, it is poured with the liquid nitrogen into a small tube. Photo by Silvia Kempen. 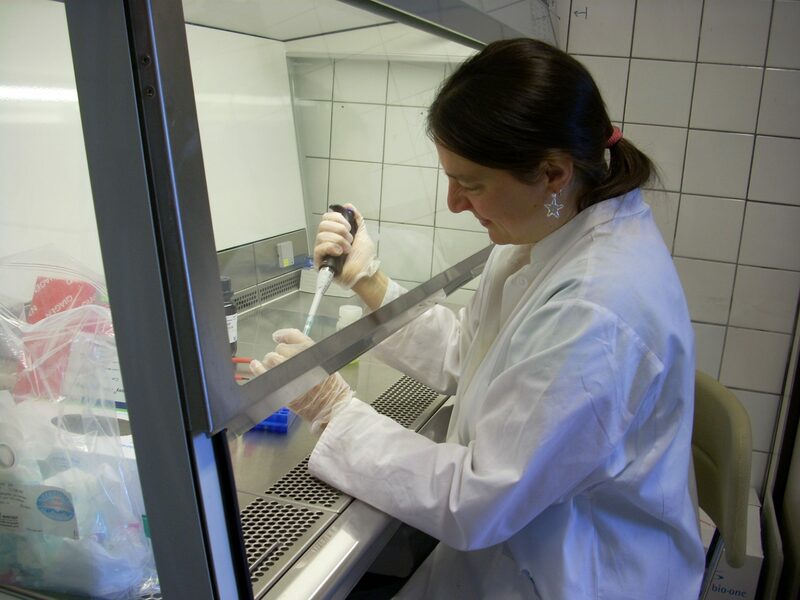 Here I am extracting the RNA of the ground leaf tissue at the clean bench in the lab. Photo by Simon Pfanzelt. Once the RNA is extracted and cleaned up, it is checked to determine whether it is of sufficient quality and quantity for sequencing. The next step will be to send the samples to a sequencing facility, and hopefully soon I will get some new data to analyse! Another part of the project involves determining genome size, that is, measuring how much DNA (deoxyribonucleic acid) a particular plant contains in the nuclei of its cells. 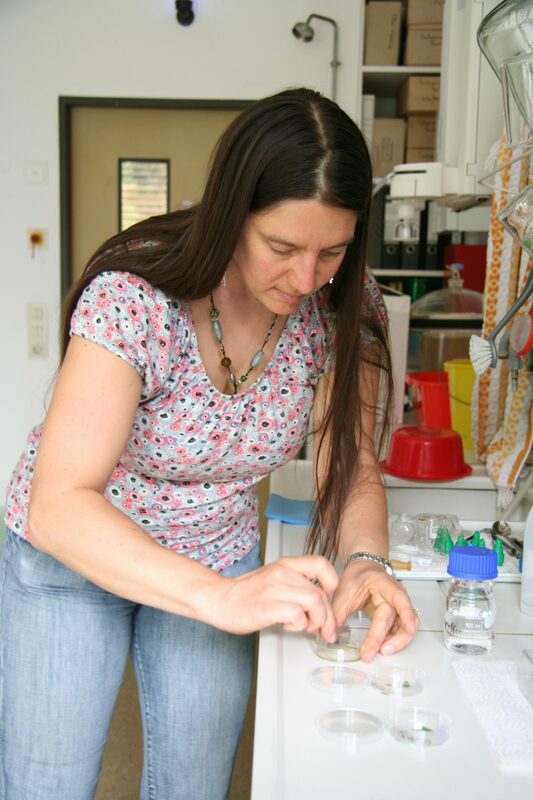 By working with Silvia Kempen, one of the technicians in the lab, I have learned how to use a flow cytometer and have measured the genome size of several Veronica species. 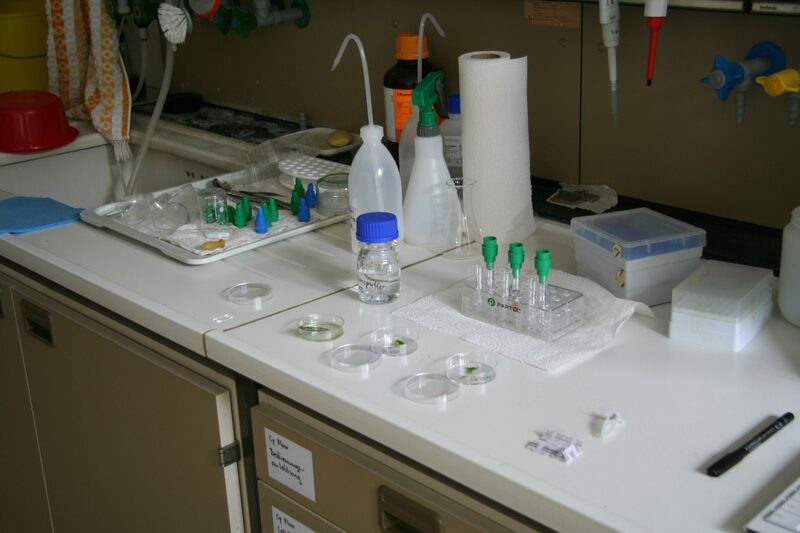 Getting everything ready in the flow cytometry lab to measure the genome size of three samples, May 2013. Photo by Silvia Kempen. 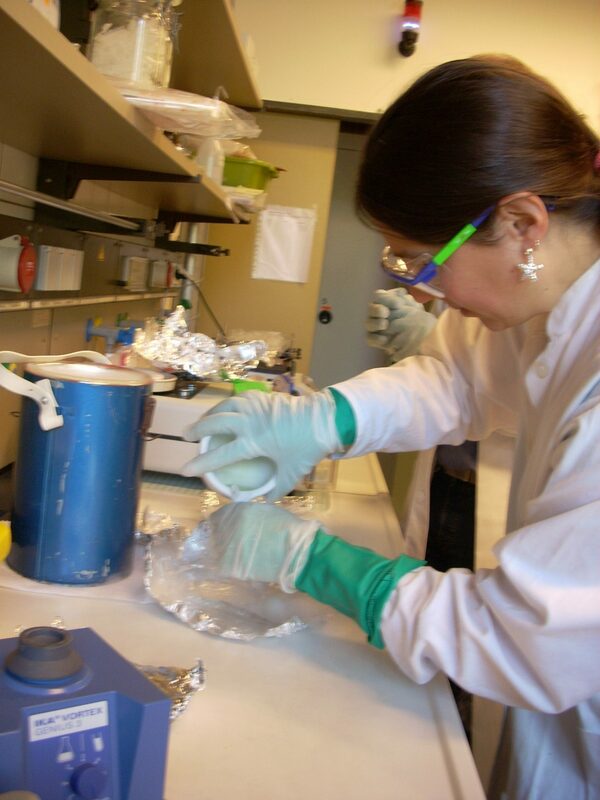 Chopping up the leaves from the first sample with a razor blade in preparation for flow cytometry, May 2013. Photo by Silvia Kempen. Watching Silvia calibrate the flow cytometer, which is the small machine to the right of the computer. 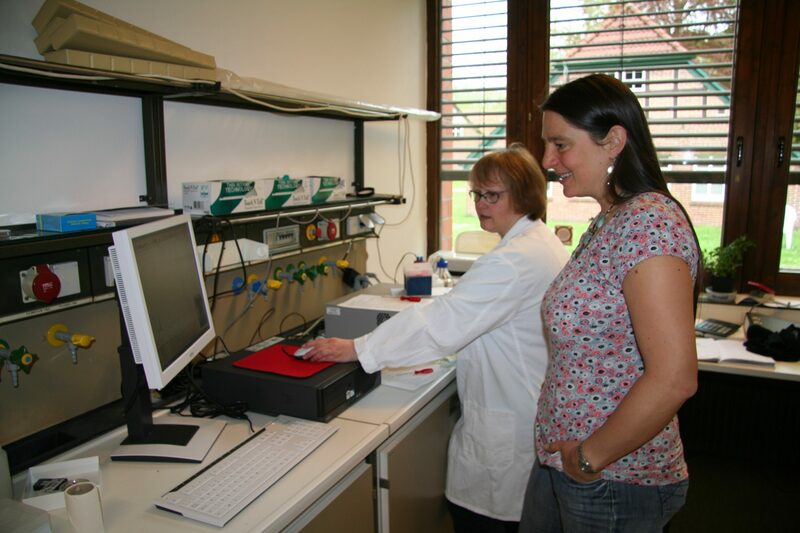 Once the machine is calibrated, it is ready to measure the genome size of our prepared samples, May 2013. Photo by Eike Mayland-Quellhorst. I must admit, the lab work has had its ups and downs, and it has taken me longer to get to this point than I had planned. One logistical problem we had, was that the plant material collected prior to my arrival did not result in good RNA extractions. That meant we needed to collect fresh plant material and retry the extractions, so I did my part by heading to Mallorca, Spain, on a collecting trip. 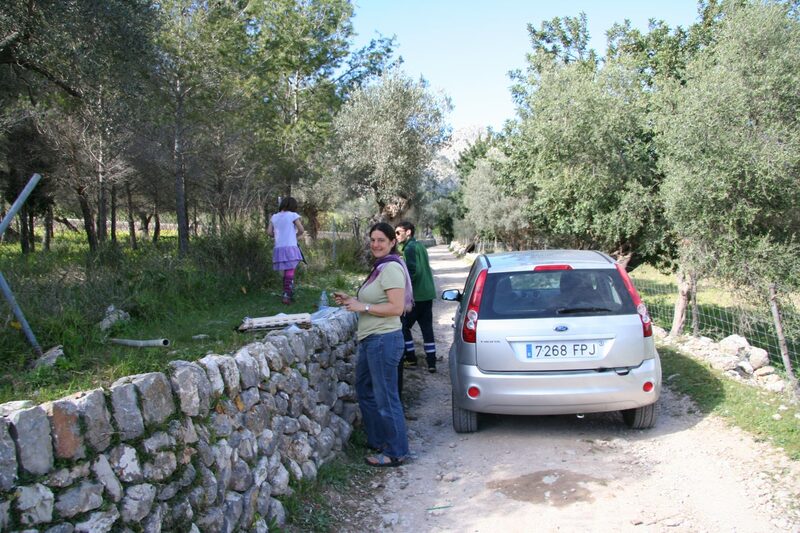 Collecting Veronica plants in Mallorca, Spain, with local botanist and PhD student Jaume Seguí Colomar. Photo by Mauricio López. But perhaps delays, hiccups and changes are to be expected when one is learning new techniques, in a new lab, in a new country, and in a new language, no less! Although I speak quite a bit of English at the university, I am taking an evening language course, and I seek out daily opportunities to practice German with my colleagues. Speaking of which, here they are! 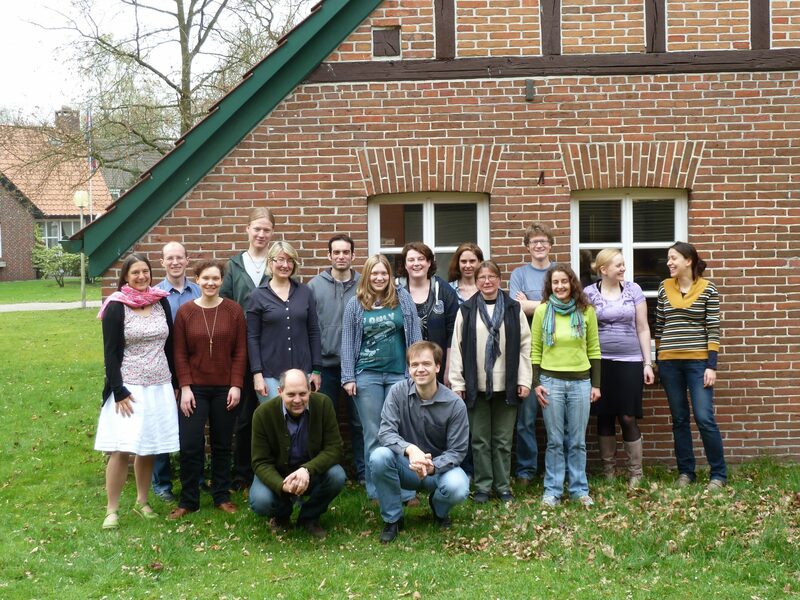 Photo of Dirk Albach’s working group, outside our office and lab space at the Universtiy of Oldenburg, May 2013. Standing, left to right, Heidi Meudt, Eike Mayland-Quellhorst, Vera Mageney, Niklas Buhk, Katarzyna Palinska, Thomas Schmidt, Jane Looschen, Jennifer Nolzen, Lillian-Lee Müller, Imke Notholt, Simon Pfanzelt, Ute Friedrichs, Maria Brandes, Lena Koehler. In front, Bernhard von Hagen and Dirk Albach. Photo by Gerhard Zotz. 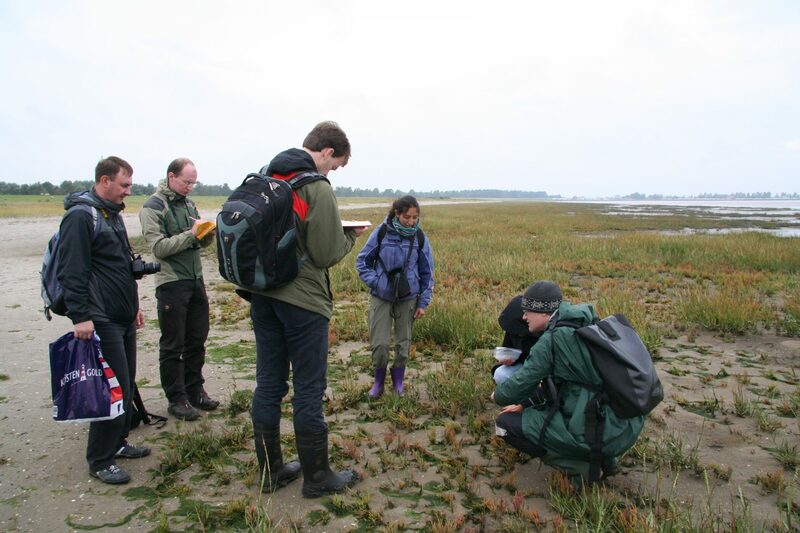 Lab outings and field trips are a great way to get to know each other. One day last October, we took a trip to the nearby North Sea coast to the Wattenmeer (Wadden Sea), which is a UNESCO World Heritage Site. At the Wattenmeer (Wadden Sea) along the North Sea coast in Germany in May 2013. From left to right Petr Kosachev, Eike Mayland-Quellhorst, Dirk Albach, Carolina García, Simon Pfanzelt. Photo by Heidi Meudt. 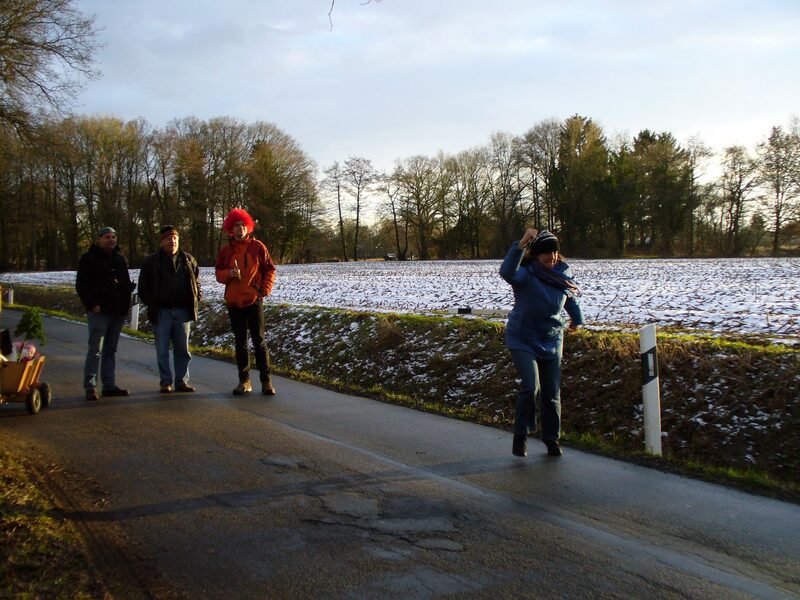 Then in February, one afternoon our lab took a “Grünkohlfahrt” (literally, “kale walk”), which is a regional custom involving walking around with your friends or colleagues while eating, drinking, and playing special, regional games together. Oldenburg claims to be the kale capital of Germany. Here I am on our Grünkohlfahrt (“kale walk”) taking my turn at the northern German sport called “Boßeln”, which is essentially outdoor road bowling! Feb 2013. Photo by Silvia Kempen. 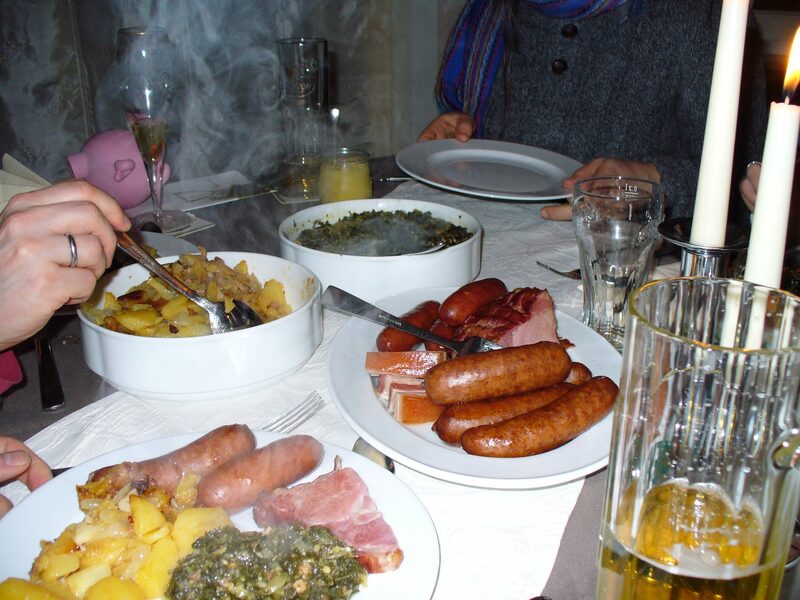 Our traditional northern German dinner after the “kale walk”, including two types of German sausages (Pinkel and Kochwurs), potatoes, and (of course!) kale! Feb 2013. Photo by Silvia Kempen. And earlier this month, we had a very exciting special visitor, Radio New Zealand journalist Veronika Meduna, who came to interview Dirk and me about our collaborative research. You can hear the resulting interview here. 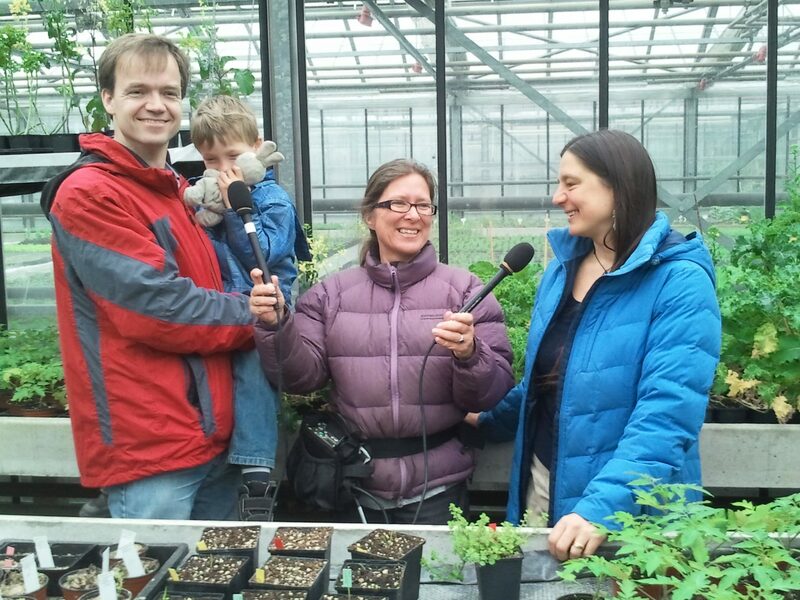 Dirk Albach and his son Felix, Veronika Meduna, and Heidi Meudt in the University of Oldenburg glasshouses during our interview. There is one Veronica plant in a pot in front of us, and several kale plants behind us. April 2013. Photo copyright Veronika Meduna, Radio NZ National. On both professional and personal levels, our experience in Germany so far has been at times enlightening, challenging, surprising, and overwhelming. Germany is a great place to do scientific research, and there are countless opportunities to learn about and experience its fascinating culture and history. Our first 9 months have certainly qualified as an adventure so far, and I look forward to experiencing what the next 9 months will bring. A big thank you to my whanau for supporting and accompanying me in this adventure. 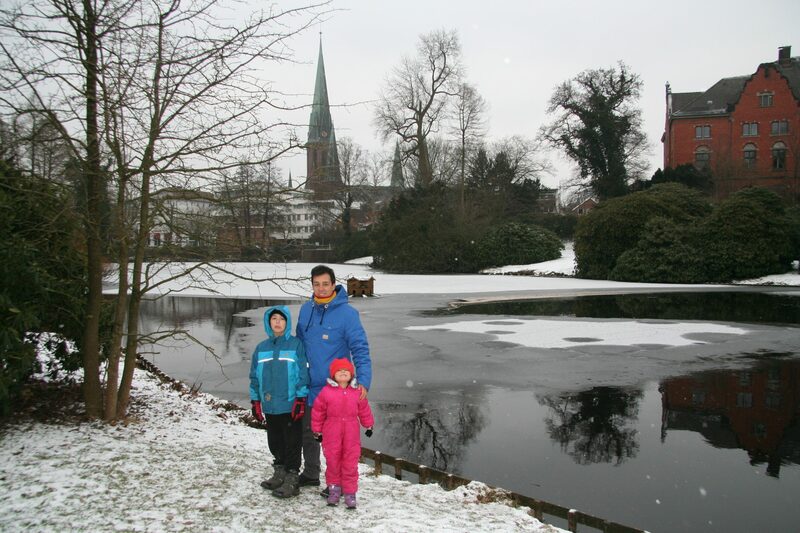 Here they are in the Schlossgarten (Palace Garden) in the winter snow! The main church of Oldenburg, Lambertikirche, is in the background. Jan 2013. Photo by Heidi Meudt. Te Papa's Blog | Tschüss, Deutschland! Keep up the awesome work Heidi!. Thanks for sharing your adventure.